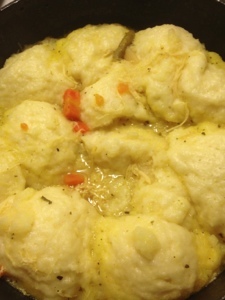 Memoirs from My Kitchen..: Dumplings!! I made a pot of chicken soup the other night to use up the rest of the chicken I had bought before it spoiled and it'd been sitting in the fridge until last night when I was so cold after walking home from the bus stop because there's no gas around my area at all and my Jeep's been sitting parked by my house for 2 days now and I'm taking the train to work.. it's just what I've gotta do for now. .......But anyway... the chicken soup..
2. Drop by spoonfuls into boiling soup/stew/broth cover and simmer for 15 minutes. Do not take off the lid while it's cooking!